So I spent a few evenings with Rust, and I have managed to do some pretty trivial stuff with it, but then I tried to do something non trivial (low level trie that relies on low level memory manipulations). And after realize that I just have to fight the language non stop, I am not going to continue forward with this. I have a buffer, that I want to mutate using pointers, so I allocated a buffer, with the intent to use the first few bytes for some header, and use the memory directly and efficiently. Unfortunately, I can’t. 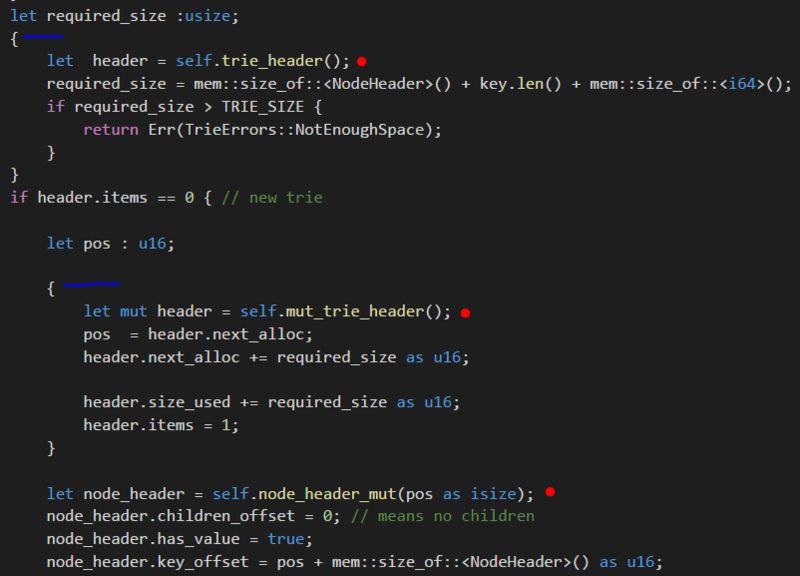 I need to mutate the buffer in multiple places at the same time (both the trie header and the actual node), but Rust refuses to let me do that because then I’ll have multiple mutable references, which is exactly what I want. It just feels that there is so much ceremony involved in getting a Rust program to actually compile that there isn’t any time left to do anything else. This post certainly resonated with me strongly. That is about the language, and about what it requires. But the environment isn’t really nice either. It starts from the basic, I want to allocated some memory. Sure, that is easy to do, right? alloc::heap::allocate is only for unstable, and might change underneath you. alloc::raw_vec::RawVec which give you raw memory directly is unstable and likely to remain so. Even though it is much safer to use than directly allocating memory. We are talking about allocating memory, in a system level language, and unless you are jumping through hops, there is just no way to do that. No debugger beyond println (and yes, I know about GDB, that ain’t a good debugging experience) is another major issue. I really want to like Rust, and it has some pretty cool ideas, but the problem is that it is just too hard to actually get something done in any reasonable timeframe. What is really concerning is that any time that I want to do anything really interesting you need to either go and find a crate to do it (without any assurances of quality, maintainability, etc) or you have to use a nightly version or enable various feature flags or use unstable API versions. And you have to do it for anything beyond the most trivial stuff. The very same trie code that I tried to write in Rust I wrote in one & half evenings in C++ (including copious searches for the correct modern ways to do something), and it works, it is obvious and I don’t have to fight the compiler all the time. Granted, I’ve written in C++ before, and C# (my main language) is similar, but the differences are staggering. It isn’t just the borrow checker, it is the sum of the language features that make it very hard to reason about what the code is doing. I mentioned before that the fact that generics are resolved on usage, which can happen quite a bit further down from the actual declaration is very confusing. It might have been different if I have been coming from an ML background, but Rust is just too much work for too little gain. One of my core requirements, the ability to write code and iterate over behavior quickly is blocked because every time that I’m trying to compile, I’m getting weird complication errors and then I need to implement workarounds to make the compiler happy, which introduce complexity into the code for very simple tasks. We’ll ignore the unstable API usage with lookup_host, or the fact that it literally took me over an hour to get 30 lines of code out in a shape that I can actually demonstrate the issue. There is a lot of stuff going on here. We have a cache of boxed strings in the hash map to maintain ownership on them, and we look them up and then add a cloned key to the cache because the owner of the host string is the caller, etc. But most importantly, this code is simple, expressive and wrong. It won’t compile, because we have both immutable borrow (on line 17) and a mutable one (on line 25 & 26). And yes, I’m aware of the entry API on the HashMap that is meant to dealt with this situation. The problem is that all those details, and making the compiler happy in a very simple code path, is adding a lot of friction to the code. To the point where you don’t get anything done other than fight the compiler all the time. It’s annoying, and it doesn’t feel like I’m accomplishing anything. I'm a fairly inexperienced Rust programmer and have definitely felt your pain, particularly with regard to lifetimes being lexical. And just now I tried to implement a solution to this using entry(...).or_insert_with which doesn't compose with error handling. Definitely lots of sharp edges that I hope this year's rust roadmap will address. It won’t compile, because we have both immutable borrow (on line 17) and a mutable one (on line 25 & 26). This is a pretty well known annoyance, and your frustration with it is pretty well warranted. The borrow checker should understand that in line 25 the borrow is unaccessible, but it just can't reason about the code so well just yet. This is more due to the execution of the borrow checker, than it is due to it's design. There is a lot of perfectly valid cases that the borrow checker rejects because it can't reason about the code well enough, but the work on that is, as far as I know, underway. This is suboptimal since you always do a lookup twice, even on cache hit. There are other ways around it using hash_map.entry(key).or_insert_with(func) for this particular case, but they have other drawbacks (key has to be an owned String, can't return io errors from within closures). Using .collect() to get a vector out of an iterator is shorter, easier and more idiomatic (and potentially faster since the iterator can figure out how big of a vector to allocate). String is already heap allocated, no need for Box<String>, it just creates an extra layer of indirection. It's preferable to use &str in function signatures when taking references to strings. &String will automagically turn into &str in that case, and should the caller only have &str to begin with, they don't have to allocate an intermediate String to get a reference to it. TLDR: Probably wait till borrow checker matures and try again. Nicolas, And yet that is what I need. I have a buffer that I need to write to in multiple locations. ( I need to write an element to the end, as well as update the item count in the header, frex ). On Windows Rust is debuggable in Visual Studio, on other platforms you can use GDB or LLDB. VS cannot properly display all types but it is better then nothing. @Oren Eini: Could you show us the the full source of your trie implementation, please? That would allow the community to help with the particular problems. I've enjoyed reading about your experiments with Rust. I've toyed with D language a bit and would love to see you try it and blog your experience with it in a similar experiment. (dlang.org) -- I'm not affiliated with it in any way. Just a curious observer. Thanks. I haven't really started playing with Rust yet, but isn't your requirement to write to the buffer in multiple locations exactly what "unsafe" is for? Rust is supposed to give you a lot of protection from accidentally mutating code in multiple places, but "unsafe" Rust lets you ignore those constraints when they don't make sense. I think that Rust want you to create an interface for this, and then you can use unsafe from behind the scenes to operate directly on memory. Trying to change a memory buffer seems like an good fit for unsafe :-). A small correction: you can build/run the Rust project in IntelliJ Rust, you need to create a run configuration manually, or use contextual Ctrl+Shift+F10 shortcut. The UI about make project and SDKs is mightily confusing at the moment, because these are specifics of Java language support, which we don't use in the plugin. This is explained more thoroughly in the docs and FAQ. Surprised you didn't mention Atom + Tokamak. It has, by far, the best experience as a Rust IDE. It has much superior editing, linting, and support for sub-second clippy linting in ways that VS Code cannot compare, although it doesn't feature intellisense support in autocompletion. It's much easier to set up than VS Code, and the multi-cursor support works a lot better. Also, the phrase "fighting the borrow checker" is a little harsh. It's more accurate to say that you're just learning to dance with the borrow checker. It's a temporary phase that lasts about a week, and at most two weeks, especially if you're trying to do something this complex right off the bat. You can write your software in a way that avoids the need to get two mutable borrows at the same time. I don't have your full source code so I can't show you how for that scenario though. You are doing a number of odd things with your code though, such as boxing a String, which is pointless because a String is just an alias for a Vec<u8>, which is already boxed. Boxing a String just turns it into box of a box of bytes. It's also odd to take an &String as an input parameter instead of an &str because an &String is basically a reference to a reference of values, basically you're doing &String(Vec<u8>) instead of &[u8] as you get with an &str. Clippy should warn about this and many other issues in your source code that aren't idiomatic, so I'd highly recommend developing with Clippy as your linter of choice. This is something you should ask for help with, and it would be even better if you provide the full source code to your issue in the first screenshot. I'm sure we can find out what's going wrong with the way you're structuring the code. You should never have two mutable borrows to the same object. It is pretty raw form, I'm afraid. Blacktiger, Yes, I'm well aware that I need to use unsafe for this, I have no problem with that. The issue is that even with unsafe, this is not allowing me to do it. Michael, Intellisense is a far more valuable thing for me, since I'm not familiar with the API at all. And I'm not really sure what multi cursor is, so I don't think it is needed. Clippy linting is also an unfamiliar term? And the idea is that I have a buffer that I need to mutate in several places, which is something that is very natural to do. You still get code completion suggestions provided by racer without intellisense. Intellisense just makes it easier to complete by typing shortcuts instead of needing to match from left right. I'd take the lack of intellisense over the severe lack of editing capabilities in VS Code any day though. IE: copying a block of code from one indent to another completely breaks formatting in VS Code, but Atom automatically corrects the indents so it's perfect when you paste. As for multi-cursor, you'll start using it once you know what it is. It is one of the things that makes me highly productive when programming. There are two ways that you can create multiple cursors. The first is by holding Ctrl and using the up and down keys to duplicate your cursor. When you start typing, or deleting, each cursor will apply the same action. The second way to create them is to highly a section of text and press Ctrl + D to highlight the next occurrence. Each time you press Ctrl + D, another cursor will be created with the next occurrence highlighting. You can then modify all regions at the same time. The problem I have with VS Code's implementation of multi-cursor editing is that it isn't case-sensitive, which is complete nonsense for a code editor. If you highlight a word typed as string and press Ctrl + D a few times, chances are that it will also highlight occurrences of String. I've no idea why Microsoft chose that behavior. As for Clippy, clippy is the name of a tool written in Rust for extending the available lints that Rust has to offer. Because it's basically a compiler plugin, you need to use a nightly compiler to compile/install it. Although it's pretty easy to install with Cargo. A list of lints provided by Clippy can be found here. You will need to tell your IDE to use clippy for linting though in order to use it. If you've looked at the lint settings, you may have seen a clippy option before. Any time you update your nightly version of Rust, you'll need to remember to update Clippy too, at least until Clippy starts getting shipped as a component via Rustup. I'll look at the code later. My mistake, it's Alt + Shift + Up/Down, not Ctrl. Just taking a quick peek at some of your C++ code, I notice the use of "stdext::make_checked_array_iterator()", which I'll take as an indicator that you're considering memory safety to be important here. You may want to consider using SaferCPlusPlus1. It allows you to achieve a more complete degree of safety by replacing potentially unsafe C/C++ elements (esp. pointers and arrays) with fast, compatible memory safe substitutes. This array, for example, is not just bounds checked, but its iterators catch "use-after-free" bugs as well. SaferCPlusPlus may be a good alternative if you're looking for memory safety sans GC, but you'd rather not deal with the Rust borrow checker. duneroadrunner, That is interesting to know, I'm actually using this because the compiler insisted (I had security checks on), and I didn't feel like overriding that decision at this stage. The data itself is already known to be good and out of bound isn't going to happen there. The trie is also self consistent with regards to memory, so you don't actually have any allocations or use of pointers beyond the bounds of the preallocated array that live as long as the object. Rust lets you have multiple mutable references. Check out Cell and RefCell: http://manishearth.github.io/blog/2015/05/27/wrapper-types-in-rust-choosing-your-guarantees/ or if you're comfortable, feel free to use UnsafeCell. I also struggled for a long time, fighting the compiler. I haven't found a resource that serves as the Rust equivalent of "Functional Programming in Scala" where it ends a high-attrition compiler-war with a deep dive and set of exercises. Anyone know of one? Yeah, I think Visual Studio's security checks have always been problematic in that way. Their recommended "safe" elements are often non-portable and either unnecessary where you're not concerned about the safety issue, or inadequate where you are. Imo safety is a big part of Rust's value proposition. When safety is not a concern, a lot of Rust's inconveniences can seem kind of pointless. When (memory) safety is of concern, as far as I can tell, SaferCPlusPlus is really the only (non-GC) solution comparable to Rust in terms of safety 1 and performance. That may change if/when the "C++ Core Guidelines Lifetime Safety checker" 2 achieves the ability to detect all memory bugs with a reasonable rate of false positives. Some are skeptical that will happen anytime soon. I'd like to try to help you with your code. Could you perhaps elaborate on why you want to store your trie in a buffer? Is the intent to be able to read the bytes from somewhere and then quickly read the trie without any explicit deserialization step? As far as I can tell, both your C++ and Rust code have a lot of undefined behavior. In particular, you frequently cast from char * to a pointer to a type with a stricter alignment than char, and then you dereference that pointer. (A violation of the "strict aliasing" rule.) I see this happening in your C++ code: https://github.com/ayende/trie-cpp/blob/master/trie/trie.cpp#L238 and in your Rust code in Trie::new: https://gist.github.com/ayende/13dc2d15563ba04638d2e5c223e4bbe4 --- From where I'm standing, this is the crux of your use of unsafe. I'd be happy to answer any questions you might have! In particular, I know I would love to hear some feedback from you on how we might improve Rust. In particular, what led you to the design you chose? To add to Andrew's comment, Rust currently doesn't have an abstraction for "vec with heap header", but it would be nice to have one in the crates ecosystem -- I might write this over the weekend. This pattern is more common in C code and doesn't always make sense in Rust, but might be useful. In this case I think putting the header on the stack next to the vec is the easiest path to victory. Most of the issues here arise from attempting to use programming paradigms from C/C++ in Rust, the code very much looks like "C in Rust syntax". Rust is a systems language, but that doesn't necessarily mean that code will look like C/C++. In this case just using Vec like Andrew mentioned would lead to a safe implementation without any performance differences AFAICT. And the underlying problem is that I've some piece of memory that I need to manipulate. In particular, this is intended to be used as part of a database, and the buffer is actually memory mapped. I'm aware of the aliasing violations, and given that I'm working with x86/x64 I decided to ignore this issue for now. The fix for that, by the way, is to ensure that when we use key_size, it always move next_alloc to an 8 bytes boundary, and then everything aligns nicely. It isn't about unpacking / packing the structure, that's easy, it is about working directly with the mmap memory. I can't recall exactly why I choose RawVew, I think it was because while you can get a vector with a capacity, it is an empty vector, and will generate errors if tried to access it. Manish, Yes, this is very much a C style behavior. Take into account that the task at hand is that I have a mmap chunk of memory and I'm using that to manipulate a data structure. That comes very often in system programming (at least, when you are dealing with databases), so it seems like the best way to do that. A better Rust approach would be appreciated, so I can see how Rust deals with it. That was brutal, please give Nim a try! If you look at my fst crate, you'll see that it works with mmap directly, and none of the code that reads or writes to the buffer uses unsafe directly. It's simply not necessary. There is a lot more explicit deserialization/serialization (because it does fairly extreme byte packing). Here's the specific code responsible for reading/writing the bytes: https://github.com/BurntSushi/fst/blob/master/src/raw/node.rs --- A similar data structure with similar byte packing is used inside of Lucene. AFAIK, the fix to your strict aliasing problem is to use memcpy. As for Vec, if you do vec! [0u8; 32], then you get a Vec<u8> of length 32 filled with zeroes. But that require you to manually pull the data one field at a time, which can be really bad for maintainability when talking about complex data structures. Which contains additional nested structs, etc. Trying to work with that using this approach is a recipe for madness. But working with the struct pointer directly is extremely easy. It is via io::Read, but note that &[u8] satisfies io::Read. Trying to work with that using this approach is a recipe for madness. It's not madness, it's necessary if you want to make the most use of the memory available. Tries and finite state machines require excessive bit packing for memory efficiency. Consider that, for example, in FSTs, the vast majority of all nodes will be represented by a single byte. So you need some sort of explicit decompression step. Of course, this gives up some CPU time for reading the data. But working with the struct pointer directly is extremely easy. But it's not portable and you need to memcpy the data to avoid undefined behavior. (I'm talking about Rust and C++ here, I don't know what the story is in C#.) But yes, memcpy will require use of unsafe. I'll try to take a look at your interview challenge and code something up for you in Rust using as little unsafe as I can, now that I know more about your requirements. Andrew, The scenario in question is that I'm building databases for a living, and I wanted to see how I can implement a small feature using a different lang. The same considerations about alignments and safety are valid as well, and are handled elsewhere already. It isn't about bitpacking or stuff like that, it is about being able to operate on the data as fast and as easily as possible, and hopefully in zero copy mode. nwydo over on /r/rust/ said something which I really think deserves to be shared here. Lexical borrowck: Niko talks about precisely this issue on his blog. entry would require an explicit match on VacantEntry due to lookup_host returning a Result preventing its use in or_insert_with (this issue is common in the sense of ? error-handling breaking in the face of closure-oriented APIs). Needing unstable API-s to solve what seems like an easy problem (like DNS lookup). I think dismissing these complaints would be irresponsible. Furthermore, I think I'd also give up (at least temporarily) on learning a language if I got unlucky and managed to stumble on a lot of its issues in quick succession like that. So I have a lot of empathy for Ayende and I can't wait for us to solve all these issues this year. For those who don't follow things, let me clarify that non-lexical borrow scopes (point 1) have been on the roadmap for a while... it's just that they were blocked on a rework of the compiler internals (implementing MIR, the middle-level intermediate representation) that just finished recently. Now, we're just waiting for the borrow checker to be ported from the HIR to the MIR. Also, your site returns error 500 if the user clicks "Post Comment" with 3rd-party Google requests blocked by a tool like NoScript or uMatrix to block 3rd-party requests to Google by default. Gah! Somehow, two different revisions of that "site returns error 500" paragraph got munged together and I didn't notice before I clicked Post Comment. Did you ever try Go? I expect the same tooling problems there. Go and Rust are new languages and (still) niche languages. The amount of money invested into tooling must be <1% of the money that went into C#, Java, C++. Many developers overestimate the influence of the language and disregard tooling, libraries, documentation, help on the web and hiring. I certainly made that mistake. As far as I'm concerned pretty much all niche languages are not useful to use for almost anything for that reason. Oren, I understand that. I was trying to explain why the fst code is written that way after you called it "madness." There are production databases (like Lucene) that use precisely the same approach. AFAIK, your C++ code still has lots of undefined behavior. The code violates the strict aliasing rule in numerous places (which is orthogonal to alignment issues). Namely, while you can cast a struct to a char*, you can't cast a char* back to a struct. I know of two workarounds: you either need to memcpy or you need to cast through a union. Andrew, If I'm using the proper alignment, that is not an issue, all accesses here are always on 8 bytes boundary, which is the alignment of the structs. As for strict aliasing, you are correct that this is undefined, but I don't want to memcpy it out (I want to have zero copy), and I don't think that I can do a union here. For that matter, I never refer to the same piece of memory both as a struct and a buffer, only one or the other. And then you can cast through the union. Interestingly, I don't think the strict aliasing rule applies in Rust, but I'm not 100% on that. a char or unsigned char type. Of course, a third option is to just ignore the undefined behavior and hope the compiler doesn't do anything too clever. It probably won't. And yes, strict aliasing rules do not apply to Rust, which doesn't need to rely on type-based aliasing analysis for performance, since the behavior of references already guarantees that most memory can't be changed behind the compiler's back. Strict aliasing in C++ applies to everything except char*. It is allowed to alias anything and you can reinterpret_cast between it and any other type. I'd quote the standard but I'm too lazy at the moment.